Restricted in dry to mesic forests on northwestern Kauaʻi. The generic name Hibiscus is derived from hibiscos, the Greek name for mallow. The specific and subspecific epithet kokio comes from the Hawaiian name for this hibiscus. The subspecies is named after Harold St. John (1892-1991), a professor of botany at Univery of Hawaʻi Mānoa from 1929 to 1958 and a profilific field botanist, credited with discovering hundreds of new species. The Hawaiian name Kokiʻo ʻula is shared by our two native red hibiscus (Hibiscus clayi and H. kokio). The word ʻula means “red” or “scarlet” and ʻulaʻula refers to a deeper red. Even though the flowers of subspecies saintjohnianus are orange (ʻalani), orange-yellow (melemele ʻili ʻalani), or yellow (melemele), and not red (ʻula), they still go by the name Kokiʻo ʻula. Mākū is an additional name for this species, but meaning is unclear. Other meanings for mākū is “Firm, hard; thick, stiff, as molasses; jellied, solidified; to gel, harden; to settle, as dregs; to thicken, as cream; dregs, sediment, lees.” The connection, if any, is uncertain. 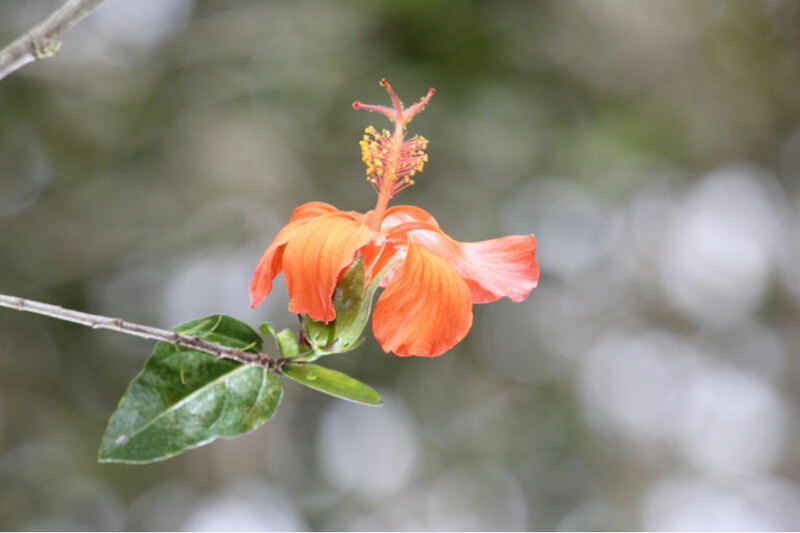 The two native red hibiscus species, Hibiscus clayi and H. kokio differ in a few ways: The flowers of H. clayi are always red; H. kokio can be red, deep red, orange, or yellow. Leaves of H. clayi are smooth, or occasionally toothed only near tip; H. kokio leaves are toothed from below middle to the tip (sometimes smooth). H. clayi is restricted to Kauaʻi; H. kokio is naturally found on Kauaʻi, Oʻahu, Molokaʻi, Maui and Hawaiʻi. H. clayi shrubs are generally more compact in habit or form than H. kokio. The wood was used by early Hawaiians to make a fine charcoal. Both the native red and white hibiscuses were grown near their houses for their flowers. The beautiful flowers were fashioned into striking lei, but lasting only a day. Kokiʻo was pounded with other plants, juice strained, and taken to purify blood. The leaves were chewed and swallowed as a laxative or mothers would chew buds and given to infants and children as a laxative. Mother would also chew the buds and give to children or children would eat the seeds to strengthen a weak child.